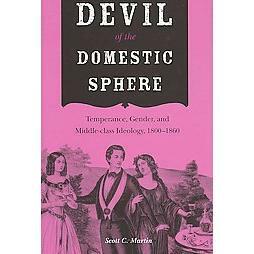 The seventeenth entry in “The Points Interview” series features Scott Martin’s Devil of the Domestic Sphere: Temperance, Gender, and Middle-Class Ideology, 1800-1860 (Northern Illinois University Press, 2008; a paperback edition appeared in 2010). Scott Martin is chair of the Department of History at Bowling Green State University, and the current Vice-President of the Alcohol and Drugs History Society. to support families and, through them, the larger society. Women’s injury through male drinking proved a powerful public relations tool for temperance activists, but it depended on an image of women as devoted, long-suffering, and tied to the home. 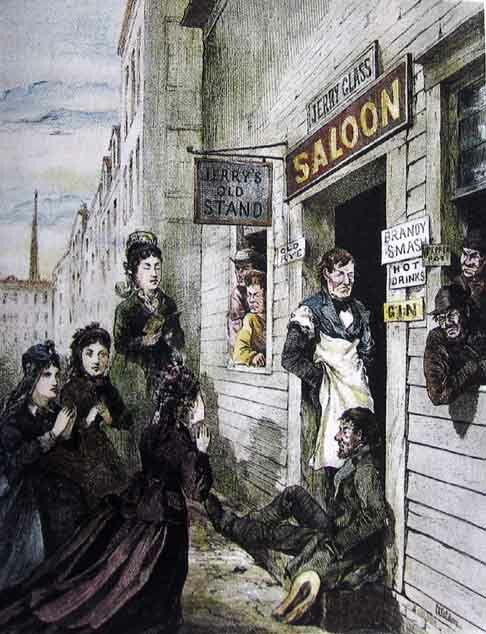 When women themselves wanted to participate actively in temperance reform, men rebuffed them. The development of this notion of middle-class womanhood complicated meaningful temperance reform and pushed some women to explore other avenues for gaining a voice, notably woman’s rights and woman suffrage movements. I hope that my book makes clear the connection between gender ideology, class, and the reform of psychoactive substances – in this case alcohol. As other historians have noted, reform efforts do not always coincide with the acute social problems caused by drugs and alcohol. Much of the ideological development I describe occurred between 1830 and 1860, when alcohol consumption was decreasing considerably in the US. This is another case of a socio-economic or political group using alcohol or drugs as a convenient issue to solidify their own identity and press their interests on the rest of society. This period is particularly significant, I think, because much of the ideological work done on gender and alcohol still continues to inform, in implicit as well as explicit ways, ideas about gender and substance abuse. The images of innocent women threatened by violent men that temperance activists used so effectively to make their case for reform took on a life of their own, and still surface in other parts of popular culture in the 21st century. The most striking thing I found in doing the research for this book was how misogynistic much of temperance literature was. Though sermons, tracts, short stories and plays expressed regret and outrage that drunken men battered and abused women, they often blamed wives for their own predicament. An ill-tempered wife, they opined, could easily drive a man to drink; a careless or selfish belle might insist that her beau toast her beauty, or thoughtless, vain hostess might serve alcohol to keep with the latest fashion. In all these cases, temperance reformers blamed women for not setting a moral example and proscribing drinking in their homes. Particularly as the eradication of drinking proved impossible, women garnered blame for not doing their part to influence men. It was an easy step to conclude that women deserved what they got from drunken husbands and fathers. With the move from moral suasion to legal coercion as the preferred temperance tactic, women became increasingly irrelevant to the reform movement. When the prohibitory “Maine Laws” passed in various states failed to stem the tide of drinking, women were left without a meaningful voice in a movement that claimed to be representing their interests. Every research project leaves some stones unturned. What stone from Devil of the Domestic Sphere are you most curious to see turned over soon? It would be very interesting to know how changes in temperance and gender ideology played out in minority communities: African Americans, Irish Americans, German Americans. Though some material on women’s temperance activism in all these groups exists, it is diffuse and relatively sparse. Knowing more about what women in these communities who remained involved in the temperance movement thought about a range of issues – the proper role of women in temperance reform, the transition from suasion to coercion, the importance of female organizations – would flesh out the story, and provide more information on how the white, middle-class gender ideology I described influenced the rest of American society. Did it exert a significant influence, was it reshaped to suit the needs of minority groups, or was it largely ignored? The easy choices would be Morgan Freeman and Helen Mirren. I’d consider casting against type, though, and trying Gilbert Gottfried and Paris Hilton. reform of psychoactive substances now so necessary……………..